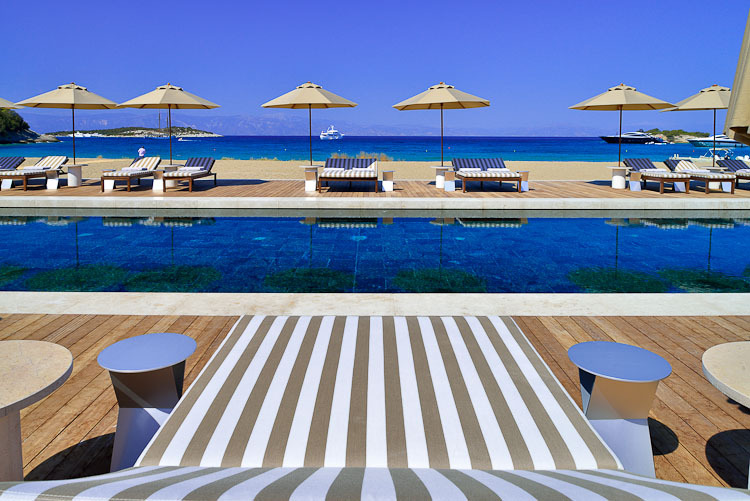 I know, it’s winter and it’s cold but can I still entice you with a stripe of Mediterranean blue and this amazing, new hotel in Greece….? 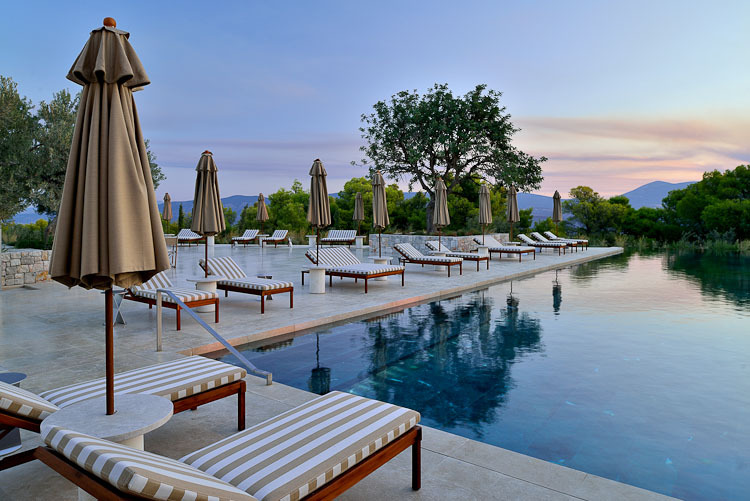 We were here when it just opened and had the opportunity to spend some time here to shoot and experience this new Aman hotel. 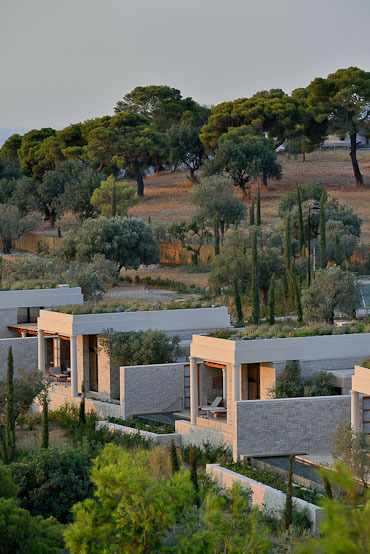 After two years of building, Amanzo’e opened in August 2012 on a huge plot of land along the eastern coast of the Peloponnese. 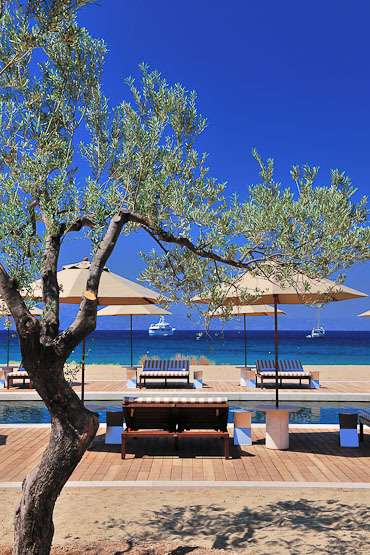 It is near the coastal town of Porto Heli and only a boat ride away from the jet set islands of Spetses and Hydra. 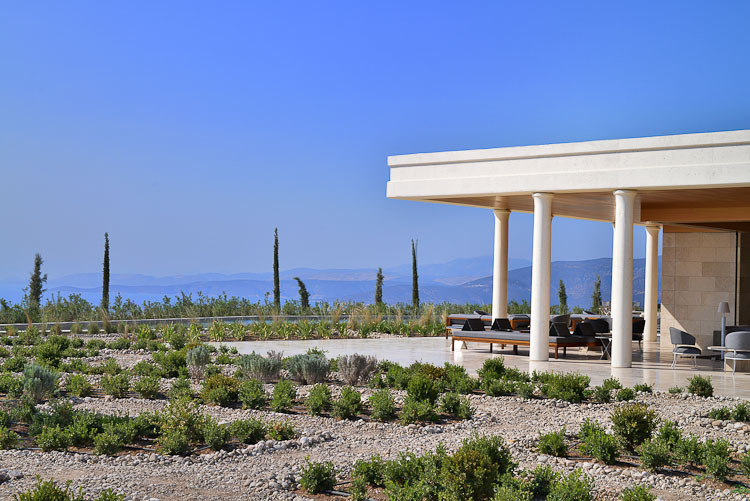 When in 2006 Adrian Zecha was taken to this spot, the hilltop of Aghios Panteleimonas, he said, “This is an Aman site.” It took Aman Resorts and their partner/investor several years to buy more than 50 plots of land from different owners needed to make Amanzo’e possible. 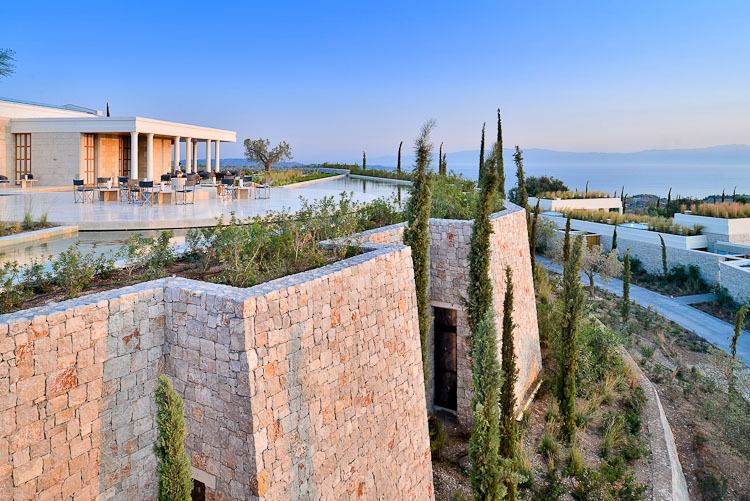 Not only pieces of farmland on the hillside but also a plot of land near the sea, in the bay of Korakia, where the Aman Beach Club is situated. It’s an ambitious project, costing over 100 million euro, with 38 guest pavilions and a dozen of villas that will be sold in the near future. 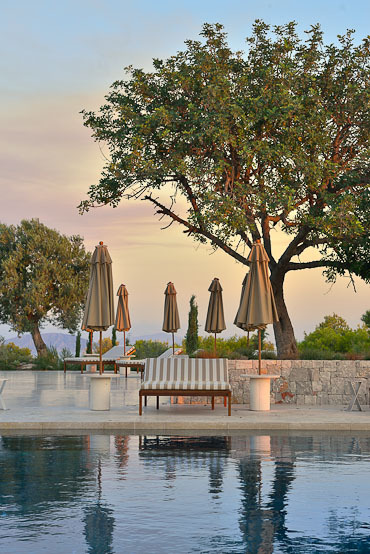 Once again, Aman Resorts turned to Ed Tuttle, the renowned American architect, who has already designed several other Aman Resorts. Tuttle studied the site for two years and came up with a very striking and rather dramatic concept. 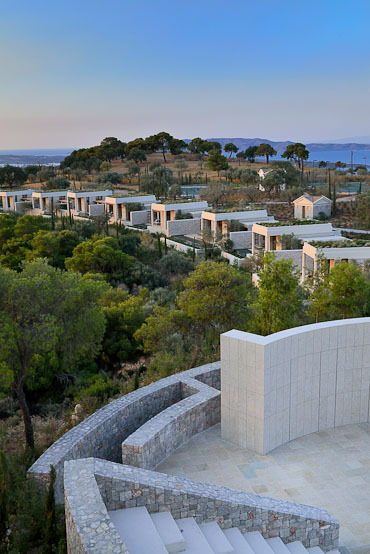 A resort with the looks of an ancient Greek village, with a grandiose temple-like décor, high ceilings with giant pillars, colonnades and lots of marble and local stone. 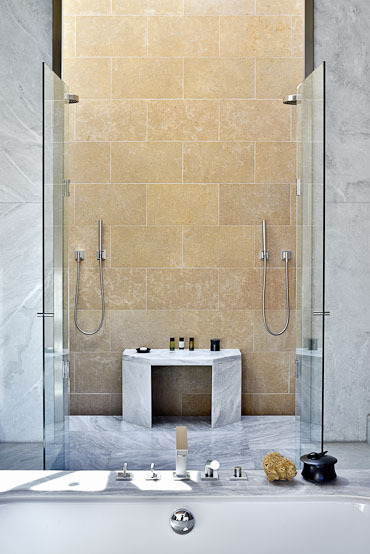 All this interpreted in a contemporary, clean style with modern furniture and accents. It’s like a smaller, 21st century version of the Acropolis. 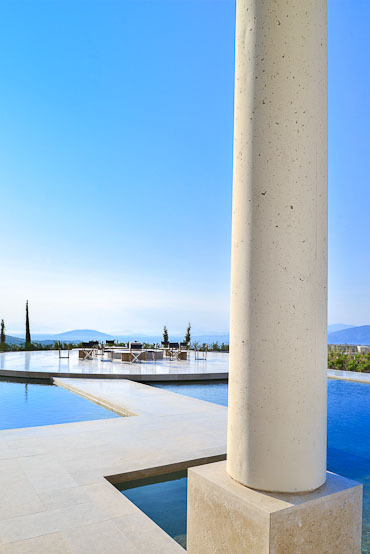 All the rooms have a courtyard entrance and a large living area opening onto a secluded private pool and pergola-shaded terrace. Glass doors slide away into recesses for comfortable indoor-outdoor living and the contemporary, custom-built furniture is locally made. The six-meter long cool pool is made of dark green marble and there is enough space on the terrace to throw a small garden party. A 20-minute drive along winding roads you will find Korakia Bay where a handful of elegant yachts and sailboats are bobbing in a tranquil sea. 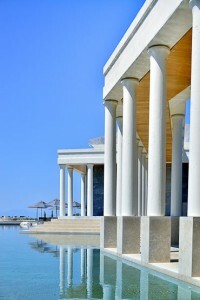 It’s here that you will the beach club of Amanzo’e. 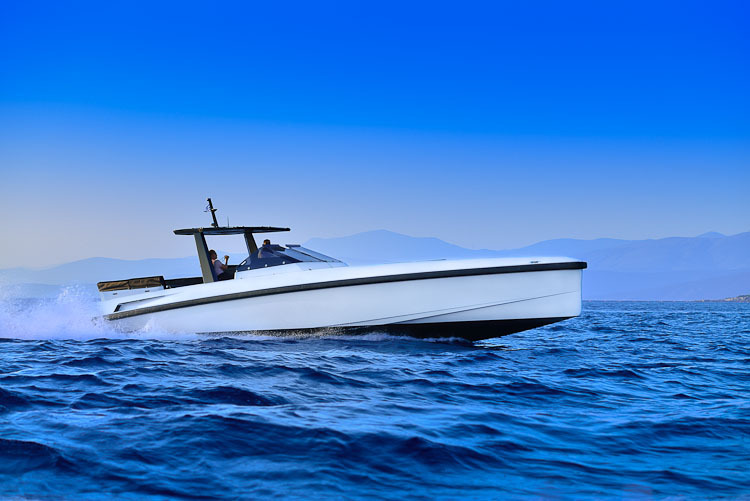 The eye-catcher in this bay is without a doubt the Wally One powerboat, the only prototype in the world. This 740 hp (with a 90km/h topspeed) is a dream come true for every boat lover in search of sophisticated sailing. 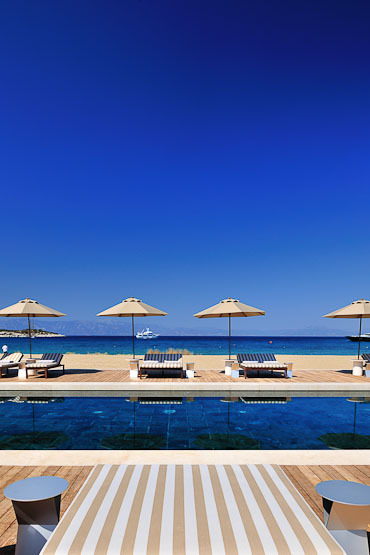 You can charter it for the day and make boat trips to Spetses and Hydra, explore the bays and secluded beaches along the coast or even take a romantic sunset cruise.Lots of glamorous yachts anchor in the Korakia bay so that guests can come and eat lunch next to the huge swimming pool. 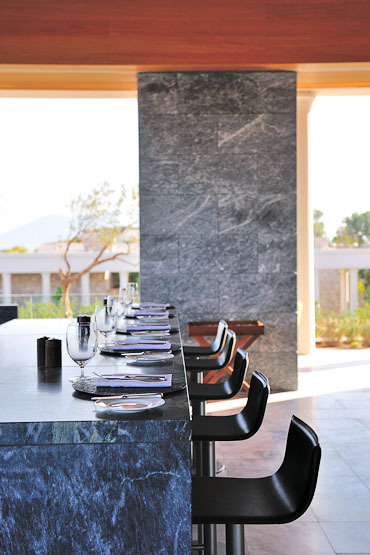 Freshly grilled octopus, locally caught shrimps from the nearby fishing village of Kilada, heavenly grilled bread topped with local herbs…The Amanzo’e menu lists all the local producers by name and where they are located. 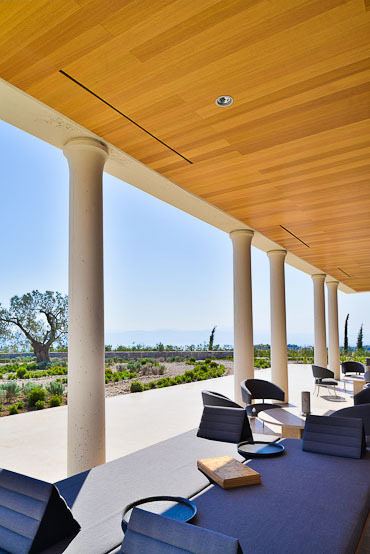 This local food approach, quite new for the Aman Resorts group, is thanks to executive chef Rick Gonzalez and his Greek sous-chef Ilias Doulamis. “We have worked very hard to present a menu with very local products,” explains chef Gonzalez. 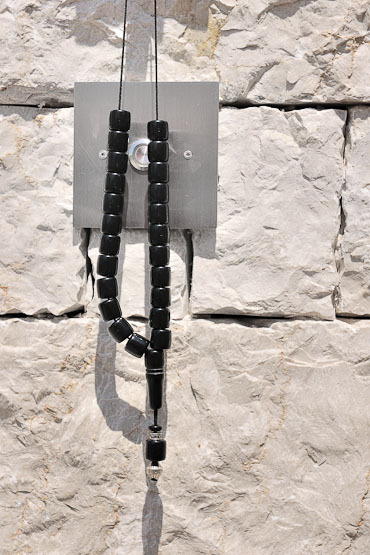 “For months we looked for producers close to the hotel who can supply us with the best products. We believe that the local community and small businesses and farmers should also benefit from a big project like Amanzo’e.” To show what they mean, Gonzalez and Doulamis take us to the farm of Pascale, who is in charge of supplying Amanzo’e with the best eggs you have ever tasted. Pascale has a farm of 400 chickens in the hamlet of Arki. He gets the special seeds for his grass from New Zealand. “Only the best for my chickens!” says Pascale who lived for more than 18 years in New York but came back to Greece because he missed the sun. Now he sells eggs, lots of eggs to Amanzo’e where Gonzalez and Doulamis turn them into the most fantastic breakfasts, served with local greens and beans. When Pascale has too many eggs, he makes pasta. “We should create some new dishes together,” he suggests to the two Amanzo’e chefs. “Why not? Come over to our kitchen and let’s see what we can make together!” says chef Doulamis. After the chicken farm, the two chefs take us to their fish supplier in Kilada and to Ermionis, the beekeeper next-door to the resort. All these small producers seem quite happy with their new client. It is encouraging to see that the smile of Pascale, the charismatic egg supplier, is as wide as the smile on the face of the well-heeled, foreign guest of Amanzo’e when he is having his 100% Greek and perfectly poached egg for breakfast. They might live totally different lives, but it’s here under the Greek sun that they are both happy and content. 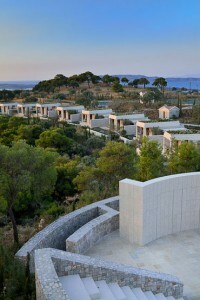 Amanzo’e is open until January and reopens again in April 2013. 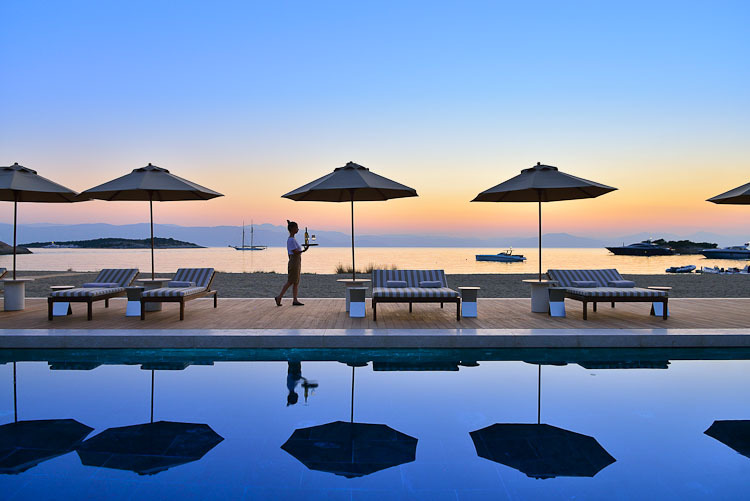 The best periods to visit Greece are in spring and autumn when the temperatures are lower and the Saronic islands are quieter. 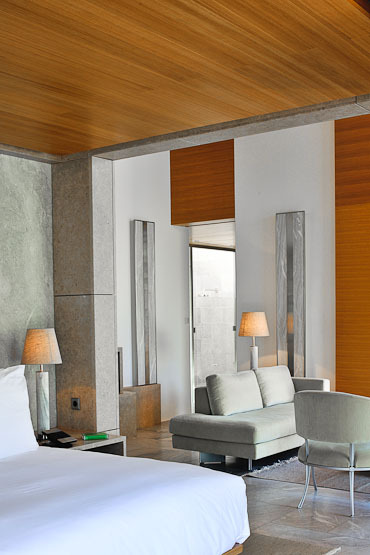 Room rates at Amanzo’e start around 825 EUR per night for a double room, plus 7% tax. Rates starting at 825 euro a night for this package.